What is justice? 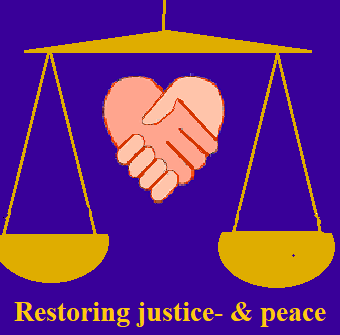 On a practical level, what is the best way to restore justice after a crime or wrong has been committed? A lot of people have been questioning the results of our traditional (and current) system of criminal justice. You can read some inspiring stories of one alternative in the links below—and then practice related words with a crossword puzzle. Deanna Van Buren is an architect who asks what a world without prisons would look like. In a recent TED talk she tells about some structures she has designed to try to facilitate dialogue and community restoration, using input from the people who will be involved. She lives and designs projects in my hometown (Oakland, California)—but it’s the quality of her ideas that impresses me so much. Some schools have also started applying these principles as they look for better forms of student discipline. The Atlantic tells the story of an ill-considered prank to show how a New Hampshire high school uses restorative justice to help students learn accountability. Edutopia provides more information and resources for interested school districts. You can practice vocabulary about justice and the court system with this crossword puzzle. The answers are here.